When it comes to bike touring, Athens is most commonly thought of as the start or end of a long distance bike tour. It is possible to take several mini bicycle tours from Athens though, such as my recent 2 day trip from Athens to Sounion and back. This time, I thought I would head in the other direction towards Chalcis on the island of Evia. This 2 day bicycle tour was conceived more with the intention of getting some training miles in and testing out kit than anything else. As Evia itself would make an excellent cycling destination, I decided to blog about the ride anyway, just on the off chance it comes in useful for anyone heading out that way! If you are planning on cycling in Greece, get in touch if you have any questions! Greece is not well known for its cycling infrastructure, and for good reason… There isn't any! With no dedicated cycling lanes or paths, the only thing to do is resort to quieter roads and pick times to exit and enter a city which are quieter with traffic. This is the route I chose for cycling from Athens to Chalcis and back. Some of this route actually covers sections of the route I took from my one week bike tour in Greece. This time though, it wasn't 35 degrees, and the forests on the mountains weren't on fire! The idea, was to spend the night in Chalcis, but also, if I arrived early enough and had energy, to ride an extra 20kms to Eretria where there is an archaeological site. I could then check it out and ride back. On setting out, I thought if I could see the site then great, if not, it would be there for next time. The majority of the cycling route back from Chalcis to Athens was the same, with the exception of passing through the ground of the old Tatoi Royal Palace on the way back. I didn't really know what to expect here, as I knew that whilst the place had been abandoned, the former gardens and grounds were open to visitors. As it turned out, because the weather was bad on the Sunday, I didn't take this route. The Tatoi Royal Palace will have to wait until another day! As it was just a two day bike tour, and there was little chance of rain (or so I thought! ), there was no need to take much gear. Everything I did take fitted into one rear pannier and my handlebar bag. I've made plenty of videos in the past about the gear I take when bicycle touring which you can check out on my YouTube channel. I've put my ‘Bike Touring Essentials' video here below, as this was the core of what I took, along with a change of clothes and a toothbrush! I left early on, and managed to cycle through the outskirts of Athens before the traffic built up too much. There seemed to be a bit of a tailwind, and I felt pretty string thundering along the road. As it turned out when I returned the following day, I must have been cycling downhill! I had every intention of making video for this two day tour, but to be quite honest, the route simply wasn't interesting enough to make one about! 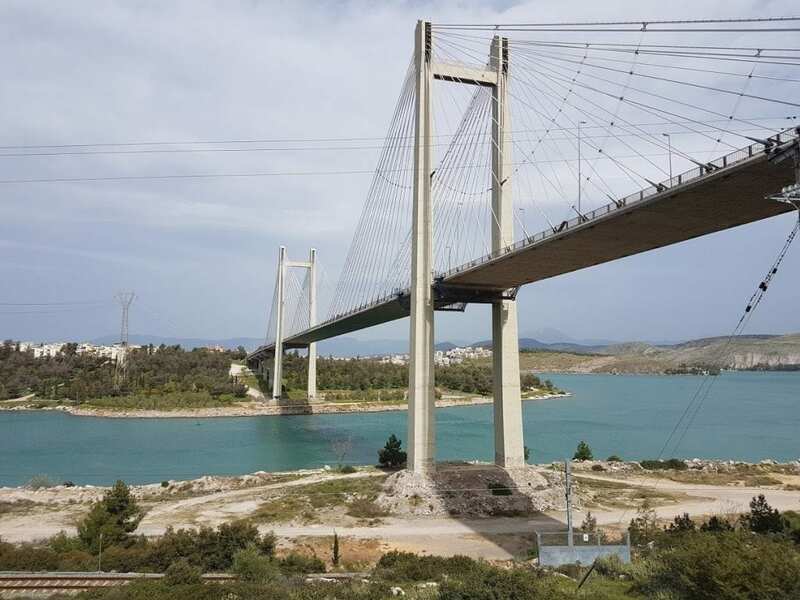 There wasn't a lot of interest to see along the way, apart from the Halkida Bridge which connects the mainland with Evia. I wasn't able to cycle over this due to road restrictions, so instead I cycled under and around a bay to cross over on the old bridge. I had wanted to follow some minor roads to my hotel, but as it turned out a lot of these ended in rubbish pits, dirt tracks, and some ‘crossings' were either washed away, or only exist when the rivers have no water in them! Still, I made it to the hotel in the end. Sadly, too late to visit the archaeological site, but after nearly 100kms in the bag, it was nice to put my feet up and chill out for the rest of the day. That's one of the best things I like about bike touring! Where I stayed – I spent the night in Chalcis in Philoxenia Hotel. Huge apartment room! Well, I thought I would be able to cycle from Evia to Athens without any rain, but it was not to be! Although it wasn't torrential, I didn't exactly stay dry either. As I had already realised that the road was not particularly inspiring (apart from the odd dog chasing me through the villages), it was just a matter of head down, and get on with it. Crossing over to the mainland, I spotted a Trojan horse. I later found out that this had been created for the 2018 carnival. Quite an undertaking, as the thing was massive! As I mentioned earlier, the route definitely took an uphill turn. That combined with the rain and the wind made it a bit of a slog, but I got back in the end. So, all in all not an exciting bike tour out of Athens, but the main purpose of getting some training miles in was achieved. It also made me think that Evia would be a nice destination for a longer bike tour. Maybe a week loop starting and finishing in Athens would be a nice possibility. If there's time later on in the year, I might give it a go! Are you planning a trip to Athens? You might find these travel blog posts useful.